I’ve written lots and lots of words this season trying to paint a picture of what we’re seeing on our Whale Watch Cruises. For Tuesday’s Wake up with the Whales Cruise, I’ll let the Humpbacks speak for themselves. Click here to listen to the latest and greatest version of the North Pacific Hawaiian Humpbacks’ song. Guests on our Mid-Morning Cruise also got to listen to some great sounds. But the highlight of this cruise was watching Mom and Baby Humpback surface, spout, and disappear under the surface multiple times. We could tell that the calf was interested in the boat…and Mom was letting him investigate, but only from what she must have considered a “safe” distance. We got some fairly close views of the two of them, but Mom wouldn’t let her baby stray too far from her. Ocean Sports Whale Fact of the Day: The haunting song of the Humpback has actually traveled beyond our oceans. In 1977, NASA launched two Voyager space crafts. 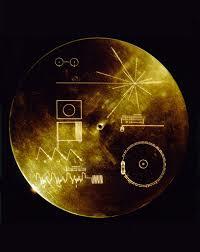 Aboard each was a golden record with a collection of sights, sounds and greetings from Earth in 54 different human languages. These records also include greetings from Humpback whales! And that was just the first time the whales’ song traveled beyond our planet…On Earth Day (4/22) in 2005, a private organization called Deep Space Network broadcast a live feed from a hydrophone off the coast of Maui of the Humpbacks singing. They used a five meter parabolic dish antenna and broadcast the sounds about 18 trillion miles into deep space. So far, we’ve yet to receive a response. Even more interesting…in 2012, NASA sent a couple of probes through the earth’s radiation belt and found that the radio waves produced within the Van Allen Belts sound an awful lot like the Humpback’s songs. Listen to a sound clip here and let us know if you agree.